I have had this audiobook in my Audible queue for quite some time and when I saw that the sequel, Head On, was coming out, I figured that I needed to move it up the TBR. Lock In was a pretty quick listen as I can throw Wil Wheaton’s narration on 2.0x and let it spin like a top, and the storyline itself isn’t too mind-blowing to understand. Scalzi throws enough futuristic science-y bits on the pages to keep just about anyone interested and has the ability to make you invest in the characters he has created. Lock In takes place in the very near future where a new epidemic has swept the nation. They have dubbed it ‘Haden’s Syndrome” and for the lucky ones out there who become infected, it is nothing worse than a severe cold. But for those unlucky one percenters, the disease causes a state called ‘Lock In’ where its victims are fully alert and aware of what is going on around them, but cannot move or interact with their surroundings. What’s nice is that technology has improved over the years and those unlucky millions have a chance to explore the world through a process called integration, where they fully take over another’s body for a period of time. But with these improvements come opportunities for some to take advantage and use Integrators for nefarious purposes. That is where our FBI agents come in as a Haden-related murder has taken place and takes our main characters to their limits to uncover the real story. Scalzi does a fantastic job bringing the reader/listener into his futuristic thriller and creating characters that bring you into their world. With hard science, gripping action, and plenty of twists, Lock In gives me a reason to read more of the author’s works and creates high anticipation to start the sequel. If you decide to go the way of audio, you have two (2) choices for the narrator: Wil Wheaton or Amber Benson. I chose Wil simply because of his narration for Ready Player One (and Scalzi’s ‘The Collapsing Empire’) and am glad I did. Wil really gets into the audiobooks he narrates and I feel like he channels Scalzi’s voice through the humor that is introduced throughout the story. It just seems like a perfect combo. 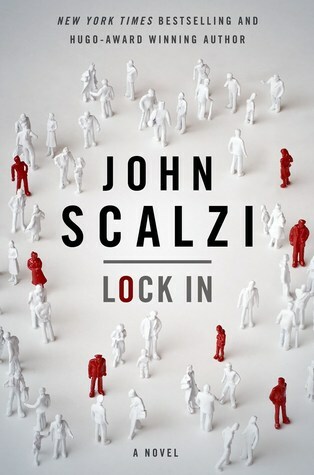 All in all, if you like futuristic cop thrillers mixed with hard science, you’ll thoroughly enjoy Lock In; and I highly recommend it if you are already a fan of Scalzi. You can bank on having a great time! You just absolutely blew my mind… I just started Head On with Wheaton, but please let me know how Benson’s narration is! I’m so glad you enjoyed this! I just finished the follow up Head On, and if you liked the mystery and action in this, I think there’s a very good chance you’ll love book two as well. I’m about halfway through Head On and enjoying it. And yeah, TBH, I’ve been picturing Chris as male this entire time. Just feel like the scale has been leaning that way since the beginning.